Renowned Harry Potter author J K Rowling has apologised for wrongly accusing US President Donald Trump of refusing to shake the hand of a 3-year-old disabled child during an event. The 52-year-old British novelist, best known as the author of the Harry Potter fantasy series, said yesterday that she deleted her July 28 tweets after she was informed that they were "not a full or accurate representation" of what had happened at last Monday's health care event at the White House. 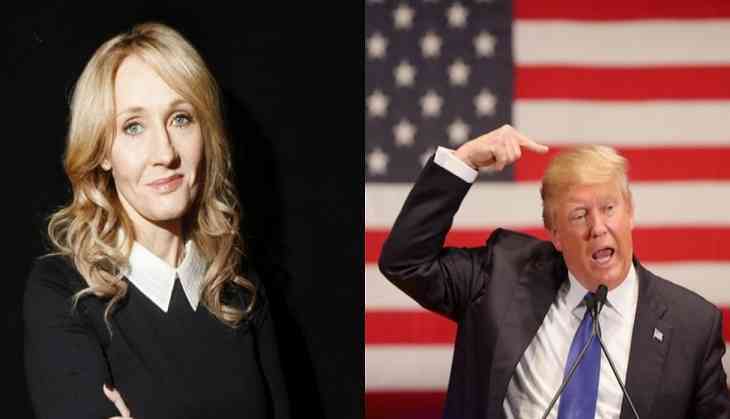 Rowling came under fire for a series of now-deleted tweets in which she slammed Trump for seeming to ignore Montgomery Weer's outstretched hand. "How stunning, and how horrible, that Trump cannot bring himself to shake the hand of a small boy who only wanted to touch the president," the author had said. But Marjorie Kelly Weer, mother of Montgomery, said Rowling's interpretation of the clip was wrong. "Re: my tweets about the small boy in a wheelchair whose proffered hand the president appeared to ignore in press footage. Multiple sources have informed me that that was not a full or accurate representation of their interaction," Rowling tweeted. "I very clearly projected my own sensitivities around the issue of disabled people being overlooked or ignored onto the images I saw and if that caused any distress to that boy or his family, I apologise unreservedly," she wrote. Trump is said to have shaken the boy's hand as the president entered the room, the BBC reported. "If someone can please get a message to JK Rowling: Trump didn't snub my son & Monty wasn't even trying to shake his hand," Kelly wrote on Facebook. She also said her son was not all that keen on shaking hands anyway. Rowling was slammed for not removing the tweets from her social media account after her comments were proved to be incorrect. Earlier, Rowling said the incident reminded her of how her mother - who used a wheelchair while she was alive - was sometimes treated by strangers.